What’s up with the new student union’s green roof? Q: What’s with the green roof on top of the new Aztec Student Union? Water drains from the rooftop garden into enormous tanks beneath the courtyard. A: Green roofs are a recent eco-trend among builders looking to turn a building’s infrequently used space into an environmentally friendly feature. At 1,382 square feet, the new union’s green roof is smaller than some others out there (the largest green roof in North America, Ford Motor Company’s River Rouge production facility in Charlottesville, VA, clocks in at more than 450,000 square feet). But it makes the most of its small size, serving both a functional, environmentally-friendly purpose, as well as a demonstration of the possibilities that green roofs offer. 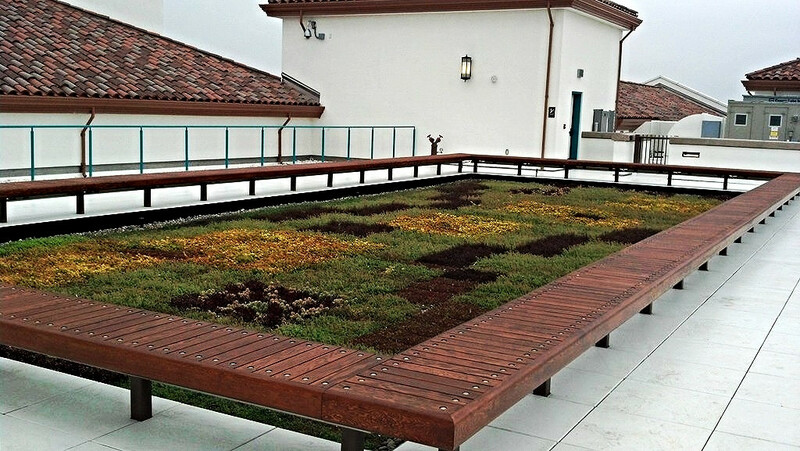 SDSU’s green roof—in essence, a rooftop garden—has a gorgeous panoramic view of campus and its surrounding hilly neighborhoods. It’s not open to the public, but eventually students, faculty, staff and other visitors will be able to attend events on the roof. When Glen Brandenburg, SDSU’s director of facilities and sustainability, gave me a tour, it was a rare overcast, misty day in San Diego. Bad for the view, but good for the green roof’s plants, Brandenburg told me. The plants in the garden are all succulents, able to survive on relatively little rainfall by absorbing moisture from air. The plants will survive just fine with only occasional watering. The succulents came pre-planted in modular containers, giving the garden its squared-off, Tetris-like pattern you see in the photo. Over time, Brandenburg said, the plants will wander and the garden will take on a more natural appearance. When it does rain, the roof drains the collected rainwater and filters and stores it in three 50,000 gallon tanks beneath the student union’s courtyard. That water is then used to water the plants around the union and provide water to the courtyard fountain. Based on average rainfall in San Diego, Brandenburg said the roof should be able to capture sine 300,000 gallons over the course of a year—more than enough to provide all the water needed for the new building’s landscaping. By capturing and filtering this water, Brandenburg added, the roof also helps to prevent runoff from carrying pollutants to San Diego’s waterways. Additionally, the garden helps to cool the building to cut down on air conditioning costs and electrical usage. But perhaps the green roof’s greatest environmental asset is its ability to inspire others to adopt similar technology, he said. Soon, solar panels will be added to other parts of the roof, further supporting the building’s sustainability. Once everything is in place, the building as a whole should use about half as much energy as a comparable building without sustainability features, Brandenburg said.